My research is focusing on the understanding of host-microbe interactions. In many animals epithelial tissues are colonized by complex communities of microbes. The diversity of microbes colonizing a host is proposed to be a result of coevolution between the eukaryotic host and the colonizing microbial community, influenced by both environment and host. These microbes influence the fitness of their hosts, ultimately forming a metaorganism consisting of a multicellular host and a community of associated microorganisms. The basis of my approach is the hypothesis that molecular host-microbe communications select for a core microbiota in a given host species which contributes to host fitness and adaptation. 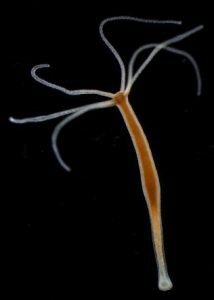 Since cnidaria belong to the early-branching metazoan and have preserved much of the genetic complexity of the common metazoan ancestor they promise to be highly informative for the analysis of epithelial host-microbe interactions. Using the two cnidarian model systems Hydra and Nematostella, I aim to understand the evolution and function of metaorganisms. Cnidaria have the simplest epithelia in the animal kingdom, with only two cell layers. While changes in the cell composition led to significant modulation of the microbial community, we hypothesize that a stable bacterial colonization is mainly controlled by the host genotype and that a direct interaction between host epithelia and microbiota exists. The innate immune system as the host’s first line of contact with the microbiota is expected to play a crucial role in the selection of the microbiota. We have shown, that antimicrobial peptides, in general, are not only killers but are the selective force and maintenance factor for stable microbial communities. As AMPs are important effectors of innate immunity throughout the animal kingdom, we propose that the secretion of specific AMPs reflect habitat-specific adaptations to facilitate the control of habitat-specific bacterial colonizers. (see Franzenburg S, et al. 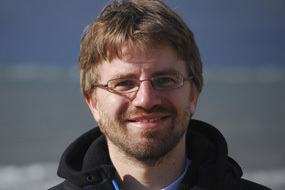 (2013) PNAS, 110(39):E3730-8, Franzenburg S, et al. (2012) PNAS, 109 (47):19374-9, Fraune S, et al. (2010) PNAS, 107,18067-18072, 17 and Fraune S, et al. (2009) Environ. Microbiol. 11: 2361-2369. Epithelial surfaces of most animals are colonized by specific bacterial communities. Therefore, it is important for the host to control both the composition and behavior of bacterial colonizers. Many gram-negative bacteria are able to coordinate their behavior using fatty-acid-derived signaling molecules of the acyl homoserine lactone (AHL) family. This cell-density-based gene regulation is known as quorum sensing (QS). Degradation of QS signals results in quorum quenching (QQ). It was proposed that bacteria produce QQ enzymes as a self-modulatory system of their own QS system, but also eukaryotic tissues seem to be able to interfere with the bacterial QS signaling directly. Up to know, only few host mechanisms targeting the communal behavior of bacteria have been identified. In this project we investigate how an animal can manipulate quorum sensing signals produced by colonizing bacteria. Using the early branching metazoan Hydra as a model, we identified a new eukaryotic quorum quenching mechanism which enables Hydra to specifically modify long-chain 3-oxo-homoserine lactones. In contrast, whole genome sequencing of Hydra’s main bacterial colonizer Curvibacter sp. revealed the presence of a complete QS machinery. Functional characterization of the QS system of Curvibacter sp. showed that both, the host-modified and the non-modified N-acyl-homoserine lactone (AHLs), were recognized by the same AHL-receptors. Remarkably, even though both AHLs were recognized by the same receptors, the gene expression induced by the different AHLs led the induction of different bacterial phenotypes. These results show that Hydra is able to regulate the behavior of its bacterial colonizers. Currently we are investigating the QQ activity of Hydra in vivo in more depth (together with the group of Andreas Tholey, Systematische Proteomics und Bioanalytik, Uni Kiel) and investigate the influence of host AHL modification for the metaorganism assembly and resilience. The phenotype of an animal cannot be explained entirely by its genes. 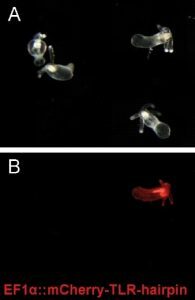 It is now clear that factors other than the genome contribute to the development and the dynamic homeostasis of multicellular animals. Two fundamentally important factors are epigenetic regulations and the microbial communities associated with the animal. Unlike the genes and regulatory regions of the genome, epigenetics and microbial composition can be rapidly modified by environmental cues, and may thus represent mechanisms for rapid acclimation of individuals to a changing environment. At present, the individual functions of epigenetics, microbiomes, and genomic mutations are largely studied in isolation, particularly for species in marine ecosystems. This leaves significant questions open for how these mechanisms intersect in the acclimation and adaptation of organisms to environmental changes. The aim of this research is to determine how epigenetic regulations and microbial communities participate in thermal acclimation of a coastal marine species residing in a dynamic temperature environment, and how these non-genetic factors interact with each other. 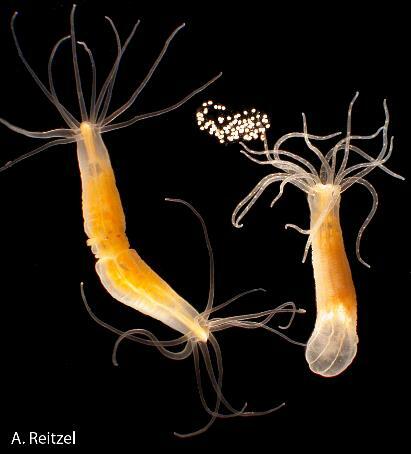 The model species used for this study, the sea anemone Nematostella vectensis, enables us to carry out unprecedented functional experiments to dissect the interactions between microbes and epigenetic mechanisms in the acclimation of the holobiont. Marine invertebrates are in constant contact with a vast number of highly diverse microbes in their environment. As such, they are ideal models for examining prokaryote-eukaryote interactions. The establishment of host-bacterial colonization during development is a fundamental process influencing the fitness of many organisms, but the factors controlling community membership and influencing the establishment of the microbial ecosystem during development are poorly understood. We have started to investigate the host molecular mechanisms involved in bacterial recognition and establishment in the marine model system Nematostella vectensis. By investigating the bacterial colonization from the earliest developmental stages to one year old adult polyps under different environmental conditions, we could clearly demonstrate the robust colonization process in Nematostella. The clear separation of bacterial communities of early developmental stages, juvenile and adult polyps is correlated to major transitions within the development of Nematostella, mostly independent of environmental factors. Thus, we hypothesize that the age dependent bacterial colonization in Nematostella is reflecting development dependent changes in the innate immune system. Therefore, one of the aims of this project is to characterize the immune system of Nematostella depending on the developmental age. We will concentrate on the immune response to bacterial colonization and on bacterial recognition. Both aspects will be analyzed at different developmental stages to assess dynamic development-dependent changes within the immune system. Mortzfeld B, Urbanski S, Reitzel AM, Künzel S, Technau U, Fraune S (2015). Response of bacterial colonization in Nematostella vectensis to development, environment and biogeography. Environ. Microbiol., 2015 Jun 1. doi: 10.1111/1462-2920.12926. Fraune S, Franzenburg S, Schröder S, Augustin R, Anton-Erxleben F, Bosch TCG (2014). Bacteria-bacteria interactions within the microbiota of the ancestral metazoan Hydra contribute to fungal resistance. ISME J., 2014 Dec 16. doi: 10.1038/ismej.2014.239. Bosch TCG, Adamska M, Augustin R, Domazet-Loso T, Foret S, Fraune S, Funayama N, Grasis J, Hamada H, Hatta H, Hobmayer B, Kawai K, Klimovich A, Manuel M, Shinzato C, Technau U, Yum S, and Miller DJ (2014). How do environmental factors influence life cycles and development? An experimental framework for early-diverging metazoans. Bioessays. 2014 Sep 10. doi: 10.1002/bies.201400065. Augustin R, Fraune S, Franzenburg S, Bosch TCG (2012) Where simplicity meets complexity: hydra, a model for host-microbe interactions. Adv Exp Med Biol. 710:71-81. Uralte Abwehr – Schon Nesseltiere nutzen Toll-ähnliche Rezeptoren als Mikroben-Detektor Auch der einfach gebaute Süßwasserpolyp Hydra besitzt bereits ein ausgeklügeltes Molekül-Arsenal, das fremde Invasoren in Schach hält. Die nur wenige Zentimeter großen Nesseltiere spüren Mikroorganismen genau wie Wirbeltiere über Toll-ähnliche Rezeptoren (TLR) auf, wie Kieler Zoologen um Thomas Bosch zeigten. Chemischer Schutzschild für Embryonen: Zwar verfügen Süßwasserpolypen nur über einen recht simplen Aufbau, dennoch erstaunen sie Biologen immer wieder. Kieler Wissenschaftler konnten nachweisen, dass sich die Embryonen der Tierchen mithilfe von antimikrobiellen Peptiden schützen. Eine Erkenntnis, die auch für den Menschen von Bedeutung sein könnte. Nicht ohne meine Mikroben! Das Immunsystem muss gefährliche Keime auf Distanz halten. Aber zur effizienten Erfüllung dieser Aufgabe gehört, wie die Forschung immer deutlicher erkennen lässt, die guten Keime zu schonen und die Kommunikation mit einer Vielzahl von Bakterien zu organisieren.